China has long been known for its knock-offs and copy-cat merch, but this latest project is some next-level kind of counterfeit crazy. 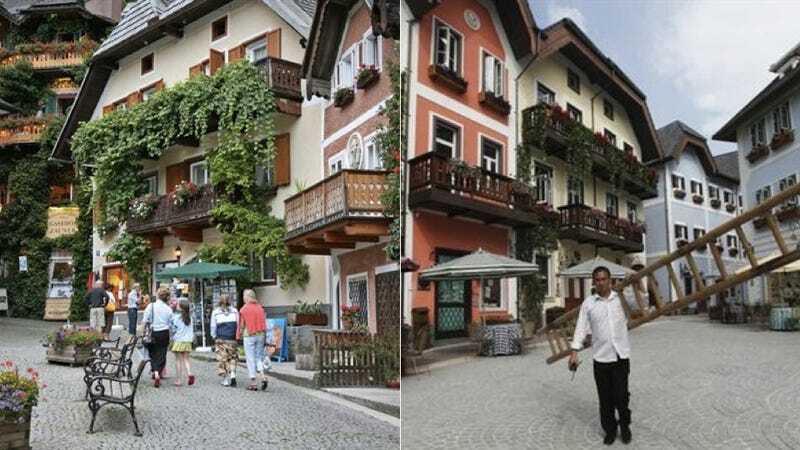 The Austrian village of Hallstat—a centuries-old village of 900 and a UNESCO heritage site that relies heavily on season tourism to survive—was recently cloned by Minmetals Land Inc., the real estate development arm of China Minmetals Corp., China's largest metals trader. Chinese Hallstat, by contrast, is a nouveau riche housing estate (in Guangdong province's Huizhou city, about 100 miles from Hong Kong). News 24 reports that Minmetals staff had been deployed to "Old" Hallstatt, where they took photos and gathered data, raising suspicions among villagers. "People in Hallstatt first learned a year ago of Minmetals' plan when a Chinese guest at Wenger's hotel who was involved with the project inadvertently spilled the beans." Many residents of the scenic hillside Austrian village were displeased to learn of the Chinese fake; at the official unveiling ceremony this past Saturday, Mayor Alexander Scheutz signed a cultural exchange agreement with the new Hallstatt, diplomatically expressing the "pride" felt by the flattered first Hallstat. "They should have asked...if we agree with the idea to rebuild Hallstatt in China," hotel owner Monika Wenger told News 24. "They did not." Original Hallstat (at left), Chinese Hallstat (at right).